Northwest Trailer and RV is Cowlitz County's Source for Great Vehicles at Great Deals! A first choice since 1995. 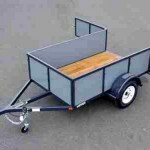 This is our most popular all purpose utility trailer is well equipped andwill easily and safely transport anything you need from camping gear to construction debris. Voyager Series has proven itself to be a reliable workhorse for homeowners and heavy duty commercial users. It’s all box tube frame, heavy duty axle and full sized wheels support the heaviest loads while its extra long tongue maintains exceptional towing stability at freeway speeds. A simple ramp accessory kit is also included that enables you to make a pair of inexpensive and effective lumber ramps if you need them. The most significant feature of this trailer is the DuraGuard side paneling. DuraGuard is made of ½” thick MDO (Medium Density Overlay) which is primed and coated for all weather durability. DuraGuard is lighter than steel, cannot rust, and will take serious abuse. We began producing the Voyager Series in 1995 and the originals are still going strong. 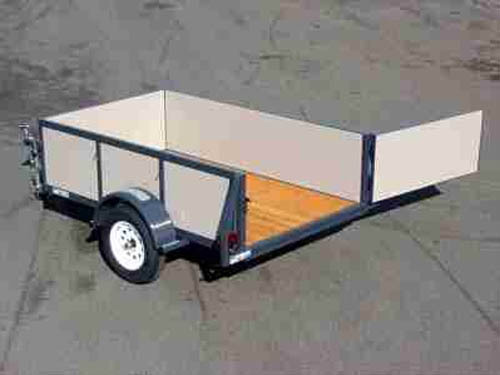 Voyager Series utility trailer is a time tested, solid design thatwon’t let you down, at a price that can’t be beat. Ask anyone you see towing an Iron Eagle trailer about the quality and value and get their opinion; we know it will be good. A simple flatbed that you can customize as you see fit. 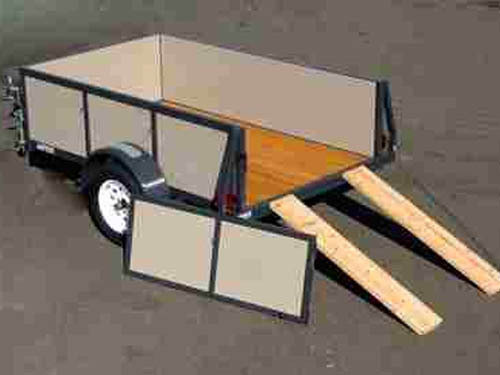 This versatile low cost trailer utilizes the same durable frame design as our other single axle models but without walls. Stake pockets are included which accommodate 2×4 posts allowing you to configure and build your own custom walls. There are several examples in our photo gallery. The 3000 Series utilizes the same frame and running gear as our Voyager and Magnum series utility trailers. A simple ramp accessory kit is also included that enables you to make a pair of inexpensive and effective lumber ramps if you need them. Our line of tandem axle flatbed trailers with a gross weight rating of 7000 Lbs. 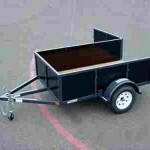 This trailer is your best choice if your typical cargo weight will be up to 2-1/2 Tons (5000 Lbs). It’s primarily used to haul Vehicles, ATV’s, Equipment, Building Materials, just about anything weighing up to 5000 Lbs. If you need a higher weight capacity, consider our 10k series. Ramps are included and are stored securely under the frame. Ramps attach to the rear to load vehicles and equipment and also attach to both sides of the trailer for side loading capability. Loading stabilizers extend to support the rear of the trailer while loading heavy cargo to drastically prevent frame stress and improve safety. Stake pockets are included on all sides of the frame to accommodate 2×4 lumber which enables you to build whatever style of removable walls or railing that you need for your particular application. There’s a tie-rail along the perimeter of the trailer for securing your cargo in any configuration. Stake pockets also double as excellent tie-down points. This model is available in two versions Standard and Dovetail. The Dovetail version is angled down at the rear and will better accommodate low ground clearance vehicles. Our line of heavy-duty tandem axle flatbed trailers with a gross weight rating of 12,000 Lbs. This trailer is your best choice if your typical cargo weight will be within 3-1/2 to 5 Tons (7000-10,000 Lbs). If you need a higher weight capacity, consider our 14k Series. Heavy duty ramps are included and are stored securely under the frame. Ramps attach to the rear to load vehicles and equipment and also attach to both sides of the trailer for side loading capability. Loading stabilizers extend to support the rear of the trailer while loading heavy cargo to drastically prevent frame stress and improve safety. Our line of super-duty tandem axle flatbed trailers with a gross weight rating of 14,000 Lbs. 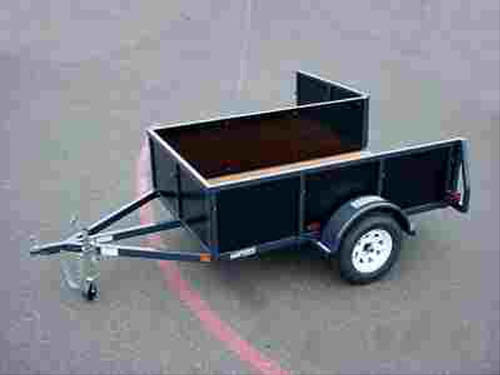 This trailer is your best choice if your typical cargo weight will be within 4-1/2 to 6 Tons (9,000-12,000 Lbs). If you need a higher weight capacity, consider our 14k Series.Heavy duty ramps are included and are stored securely under the frame. Ramps attach to the rear to load vehicles and equipment and also attach to both sides of the trailer for side loading capability. Loading stabilizers extend to support the rear of the trailer while loading heavy cargo to drastically prevent frame stress and improve safety. Designed with features specifically suited for transporting ATV’s. 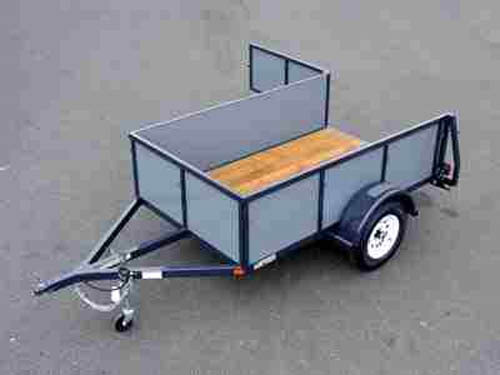 This trailer equipped with a pair of ramps that securely attach to both sides and the rear of the trailer. This enables the ATV’s to be loaded from the rear and the side (drive on – drive off). The ramps are stored underneath the trailer and are lockable to prevent theft. There’s a tie-rail along all sides of the trailer for strapping down your gear in any configuration. We’ve designed general use capabilities in to this trailer by including an abundance of stake pockets welded to the perimeter of the frame. These stake pockets accommodate 2×4 lumber which enables you to build whatever style of removable walls or railing that you need for your particular application, you can see several examples in our photo gallery. 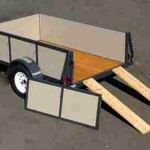 You can use this trailer to transport ATV’s one-day and yard debris or furniture the next. The ATV Series is a very practical and useful trailer. 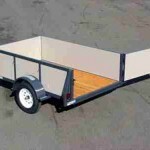 A general use trailer perfectly suited for transporting items like Golf Carts, Motorcycles, Lawn Maintenance Equipment, Mobile Pressure Washing Systems, etc. This trailer is equipped with a tailgate slot to accommodate a lumber tailgate and a 1′ high rail around the perimeter of the trailer. The box tube mainframe and heavy duty running gear is identical to the Voyager and Magnum Series. Economax is equipped with more standard than you’ll find on any other brand of a similar style, yet at a much better value. Titan Series … Our line of super-duty tandem axle deck-over flatbed trailers with gross weight ratings of 7000, 10000, 12000, and 14000 Lbs. Payload capacity range is 5000 to 11000 Lbs This is your best choice if you need a trailer without fenders. For example, loading and unloading a trailer with a forklift.Stake pockets are included on all sides of the frame to accommodate 2×4 lumber which enables you to build whatever style of removable walls or railing that you need for your particular application. There’s also a tie-rail along the perimeter of the trailer for securing your cargo in any configuration. The stake pockets also double as excellent tie-down points. Primary uses of this trailer are transporting crates, totes, and pallets of cargo. Ladder ramps and rear loading stabilizers are available options if needed. Usable deck width is 102″, deck height is 36″. VersaMax comes equipped with stake pockets on all sides of the frame. Stake pockets accommodate 2×4 lumber which enables you to build whatever style of removable walls or railing that you need for your particular application. There’s also a tie-rail along the perimeter of the trailer for securing your cargo in any configuration. The stake pockets also double as excellent tie-down points. You’ll appreciate the low deck height when handling bulky items or launching your Raft or Jet Ski into the river. You can back into the water with confidence because the taillights are marine grade LED’s and the decking is pressure treated, so go ahead and dunk it. If you’re hauling ATV’s or Motorcycles, consider adding the ladder ramp system. For River Rafts or Drift boats, the full width rear roller and/or winch mount is available. Our line of tandem axle flatbed trailers with a gross weight rating of 10,000 Lbs. This trailer is your best choice if your typical cargo weight will be within 2-1/2 to 4 Tons (5000-8000 Lbs). If you need a higher weight capacity, consider the 12k Series. Starting March 2014, we will be closed on the 4th Saturday of the month. Click here now to apply online for financing through Springleaf! New Load of Trailers Just IN!!! “Like” Northwest Trailer and RV!